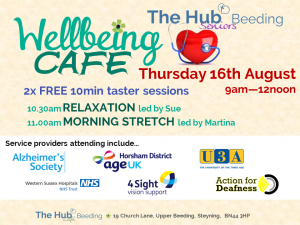 The Wellbeing Cafe meets again in August and this month we have new charities coming along and a couple of taster sessions being provided by local fitness instructors. Come along and speak with representatives from the advertised charities and others. I look forward to seeing you there. ← Thursday 2nd August Daily Notes from The Hub.